Seoul Semiconductor, a global innovator of LED products and technology, announces that its SunLike Series natural spectrum LEDs have been adopted for a lighting project to illuminate the restored murals of the Casa dei Vettii in the ruins of the ancient city of Pompeii, Italy. The lighting project was undertaken by the Lumen Center Italia’s “luum” technical lighting division, which specified the SunLike Series natural spectrum LEDs because they produce light that closely matches the spectrum of natural sunlight, which conveys the colors and textures of the restored murals accurately as they would naturally appear. 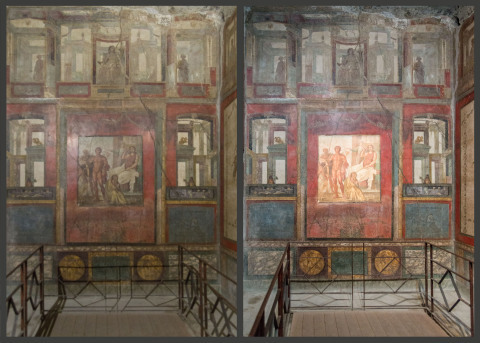 Caleb Won, the executive vice president of global marketing at Seoul Semiconductor, said “We are pleased to have our SunLike Series LED technology chosen to illuminate the murals of Pompeii, a world heritage site. This is just the latest example of the success of the SunLike Series LEDs." The Lumen Center Italia (LCI) has developed spotlights that employ nine units of 25W COB-type SunLike Series natural spectrum LEDs from Seoul Semiconductor to illuminate the restored murals in the Pompeii ruins in Casa dei Vettii, Italy. The SunLike Series LEDs reproduce the spectrum of sunlight as closely as possible to show the color of the object as it appears in natural light and provide a good sense of depth based on high contrast ratio to accurately represent the murals. Most artificial lights, such as fluorescent lights and conventional LEDs, exhibit light with a different spectrum from natural sunlight. The light output of those devices typically has a higher peak of blue light when compared to sunlight. Even conventional LEDs with a high CRI (Color Rendering Index) of 90, have a significantly lower color quality than natural sunlight. The oversaturation of blue light produces a scattering effect, causing distortion in the color of objects and making it difficult to accurately identify their contrasts. SunLike LED technology, on the other hand, produces light with superior color quality compared with conventional LEDs because the spectrum of SunLike LEDs closely matches that of natural sunlight. Conventional artificial lighting has applied the color rendering index (CRI) that evaluates color quality based on fluorescent lamps. However, as LED technology has advanced, it has exceeded the color quality of fluorescent lamps. As a result, new standards of color quality scales are being used. In particular, if the existing CRI (color rendering) was the mechanical color used for experiments and measurements, CQS is characterized by the expression of more natural colors that the human eye can perceive. In case of conventional LEDs, color rendering is high, but CQS is low. However, light produced by SunLike LEDs can achieve the best color quality in both color standards, such as color rendering and CQS because it has a 95%+ rating for both CRI and CQS. This is the same principle as expressing color by using the seven rainbow colors of red, orange, yellow, green, blue, indigo, and violet, and further segmenting and quantifying color. SunLike Series LEDs combine Seoul Semiconductor's optical semiconductor technology with Toshiba Materials' natural light spectrum technology, TRI-R technology, limits the level of blue light to that of sunlight and minimizes the light scattering phenomenon. So, premium lighting companies around the world, which need to implement the closest spectrum to sunlight with high quality, have expressed continuing interest in the SunLike LED technology. TRI-R is a registered trademark of Toshiba Material Co., Ltd. It is a natural light LED light source technology that reproduces the spectrum of natural sunlight, developed by the concept and spectrum technology of natural light. Since 1976 Lumen Center Italia (LCI) is an advanced laboratory of research, design and production of lighting fixtures. Through the latest research projects by their technical lighting division "luum", they offers the best selection of LED light sources attentive to the interaction between human metabolism and light, with a very high color rendering and a light source spectrum comparable to daylight. Lumen Center Italia by its "luum" division has illuminated art works master pieces in the Vatican Museums, Pinacoteca Ambrosiana and others, including: Leonardo da Vinci’s Codex Atlanticus, the paintings of Botticelli, Tiziano, Bruegel and many more. Seoul Semiconductor develops and commercializes light emitting diodes (LEDs) for automotive, general illumination, specialty lighting, and backlighting markets. As the fourth-largest LED manufacturer globally, Seoul Semiconductor holds more than 12,000 patents, offers a wide range of technologies, and mass produces innovative LED products such as SunLike – delivering the world’s best light quality in a next-generation LED enabling human-centric lighting optimized for circadian rhythms; WICOP – a simpler structured package-free LED which provides market leading color uniformity, cost savings at the fixture level with high lumen density and allows design flexibility; NanoDriver Series – the world’s smallest 24W DC LED Drivers; Acrich, the world's first high-voltage AC-driven LED technology developed in 2005, includes all AC LED-related technologies from chip to module and circuit fabrication, as well as multi-junction technology (MJT); and nPola, a new LED product based on GaN-substrate technology that achieves more than ten times the output of conventional LEDs. UCD constitutes a high color gamut display which delivers more than 90% NTSC. Wicop and Acrich are trademarks of Seoul Semiconductor Co., Ltd.